A phosphorothioate RNA manufacturing method that uses an oxazaphospholidine approach is characterised by the use of a cyanoethoxymethyl group instead of a tert-butyldimethylsilyl group as the protecting group for the 2' hydroxyl group of RNA. The present invention relates to a process for producing ribonucleosides phosphorothioates stereoselectively. Phosphorothioate RNA is an RNA analogue obtained by replacing one of the non-bridging oxygen atoms in a phosphodiester bond to a sulfur atom. .. For phosphorothioate RNA is high nuclease resistance and cell membrane permeability compared to native RNA can be expected, currently the most promising RNA-type nucleotide pharmaceutical (Mol Cell, 6, pp.1077-1087, 2000; Biochemistry, 42, pp.7967-7975, 2003;. Nucleic Acids Res, 31, pp.589-595, etc. 2003). Phosphorothioate RNA is present two stereoisomers because it has a chiral center on the phosphorus atom (Rp and Sp form), these stereoisomers have different biochemical and physical properties, respectively known (Proc Natl Acad Sci USA, 75, pp.4798-4800, 1978;.... Biochemistry, 22, pp.1369-1377, 1983). Therefore, in the production of phosphorothioate RNA it is desired to produce selectively a compound having a desired configuration. However, it is difficult to produce a phosphorothioate RNA while controlling the solid phosphorous atom provides a method for enabling efficient stereoselective synthesis has been demanded. The synthetic method of phosphorothioate RNA, enzymatic method (Nucleic Acids Res., 10, pp.4145-4162, 1987), H- phosphonate method (J. Org. Chem., 57, pp.6163-6169, 1992), H- combines enzymatic reaction phosphonate method method (Nucleic Aicds Res., 24, pp.3811-3820, 1996), oxathiazolium phospholane method (J. Org. Chem., 61, pp.6713-6716, 1996 ) is known, it can not be said method both satisfactory in terms of stereoselectivity. Method for synthesizing phosphorothioate DNA, the optically pure nucleoside 3'-oxa The phosphorylcholine derivative derived from an optically active 1,2-amino alcohol as a monomer unit, nucleophilic small weakly acidic activator N - (cyanomethyl) pyrrolidinium triflate method of condensing with (CMPT) (oxa the phosphoryl Gin method:... J. Am Chem Soc, 130, pp.16031-16037, 2008) is known. In this way, bicyclic difference activation energy between diastereomers in a nucleophilic substitution reaction on the phosphorus atom by the use of oxa The phosphorylase Jin expression occurs remarkably, high diastereoselectivity is obtained. Further, the method, after the monomer units condensed to a solid support nucleoside derivative obtained by carriers such as Controlled Poagurasu (CPG), secondary amines 5'hydroxyl and chiral auxiliary unreacted capping of sulfide phosphite includes a step of performing deprotection of the 4,4'-dimethoxytrityl (DMTr) group at the 5'-end, by repeating the steps according to nucleotide sequence of interest it can be synthesized long chain phosphorothioate DNA. In the above publication, the synthesis of stereochemically pure phosphorothioate deoxythymidylic acid 10-mer has been reported. Methods for synthesizing stereoselectively phosphorothioates by applying the above oxa The phosphorylase Jin method for the synthesis of phosphorothioate RNA have been reported (Org. Lett., 11, pp.967-970, 2009). In this way, a stable neutral conditions in chain length elongation reaction conditions as a protecting group for RNA 2'hydroxyl can be easily deprotected by tetrabutylammonium fluoride (TBAF) tert-butyldimethylsilyl (TBDMS) groups the use, have been successfully synthesized above tetramers using CMPT as the activator, stereoselectively all- (Rp) - [Ups] 9 U and all- (Sp) - [Ups] 9 U synthesis have been made of. However, there is a problem that this method has a low reactivity, condensation efficiency is insufficient for the synthesis of long-chain oligomers. Studies of the present inventors, can improve condensation efficiency With benzimidazolium triflate (BIT) and N- phenyl-imidazolium triflate (PhIMT) as nucleophilic highly active agents more CMPT , it can be stereoselectively synthesized phosphorothioate uridyl acid 10-mer, a problem that the diastereoselectivity by epimerization proceeds is lowered by using a nucleophilic high activator. On the other hand, cyano ethoxymethyl group as the 2'-position hydroxyl-protecting groups used in the preparation of nucleic acid derivatives, such as Origoribo nucleic (-CH 2 -O-CH 2 -CH 2 -CN: CEM) is known (Org .. Lett, 7, pp.3477-3480, 2005; International Publication WO2006 / 22323). The protecting group can be removed by the action of fluoride ion under a neutral condition, the average condensation yield 97% in the case of coupling the protected monomer with TBDMS (Tetrahedron Letters, 43, pp.795-797 , whereas a second 795, left column 8-11 rows of 2002), gives the average condensation yields of 99% or more in a similar condensation reaction (Org. Lett., 7, pp.3477-3480, 2005 No. 3479, pp. 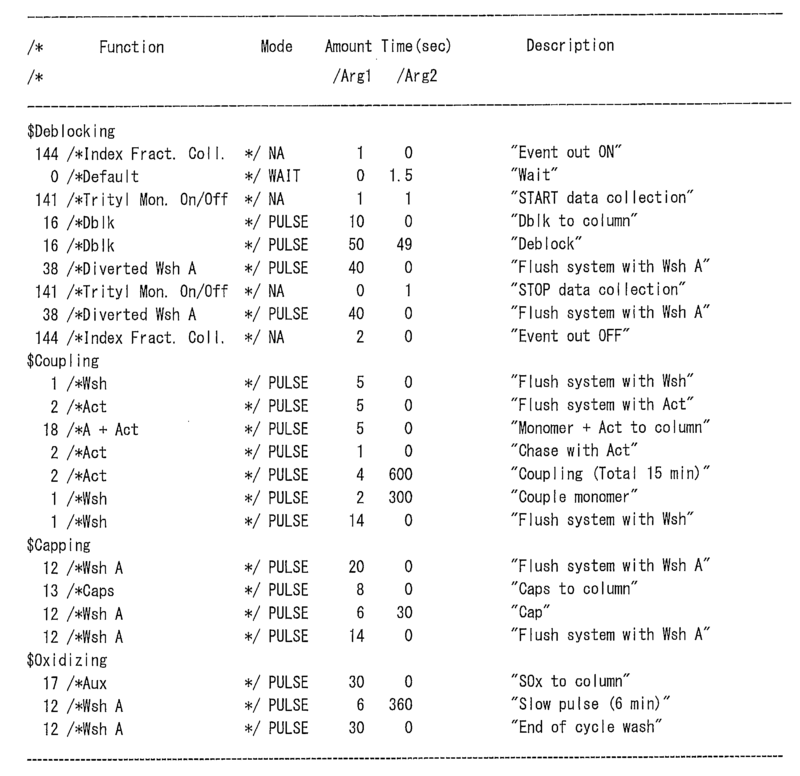 5-3 lines from the bottom right-hand column of). Although oxa The phosphorylase in Jin method patent documents disclosed (WO2005 / 92909) 2'-position hydroxyl-protecting group as 2- (cyano) ethyl group (CEE) are illustrated, cyano ethoxymethyl there is no mention of. An object of the present invention is to provide a method of synthesizing oligoribonucleosides phosphorothioates stereoselectively and efficiently. The present inventors have Org. Lett., 11, pp.967-970, has been oxa The phosphorylase gin process result to intensively studied to improve the process for the synthesis of phosphorothioate RNA by according to 2009, RNA 2' it can be achieved very high condensation efficiency with cyano ethoxymethyl group in place of tert- butyldimethylsilyl group as the protective group for a hydroxyl group, and a nucleophilic small activators N- (cyanomethyl) pyrrolidinium & It found that sufficient applicable high condensation efficiency in the synthesis of no long chain oligoribonucleosides phosphorothioates compromising diastereoselectivity is obtained in the case of using a triflate. Also, a nucleophilic highly activator N- phenyl-imidazolium triflate high stereoselectivity be used (PhIMT) is obtained, the long-chain oligoribonucleosides phosphorothioates containing four nucleobases We are obtained the sufficient applicable high condensation efficiency synthesis. The present invention has been accomplished on the basis of the above findings. (Wherein, Bs are as defined above, CEM represents a cyano ethoxymethyl group, R 5 represents a protecting group for a hydroxyl group, R 6 represents an aryl group which may have a substituent) tables in oxa the phosphoryl Gin method comprising the step of sulfide ribonucleoside after condensation being is provided. According to a preferred embodiment of the above methods, R 6 is the method described above is a phenyl group; the above carried out in the presence of a condensation activator; The above method is wherein R 5 is 4,4'-dimethoxytrityl group method; as activators N- (cyanomethyl) pyrrolidinium triflate (CMPT) or the above method using N- phenyl imidazolium triflate (PhIMT); the above method of using dimethyl disulfide (DTD) as a sulfurizing agent ; the above method the reaction is carried out in the solid phase method; or a divalent group of n + 1 X is represented by all (II-Sp), or all (II-Rp) with divalent represented the above method is provided which is a group. From another aspect, the table according to the present invention, the above general formula (I) (wherein, R 1, Bs, n, and X are as defined above, provided that R 2 is a cyano ethoxymethyl group) in ribonucleoside phosphorothioate or a salt thereof is provided is. Further, the present invention, the above general formula (IVa) or (IVb) (wherein, Bs, CEM, R 5, and R 6 has the same meaning as mentioned above) oxa The phosphoryl Jin ribonucleoside represented by the provision It is. Can be synthesized oligoribonucleosides phosphorothioates stereoselectively and efficiently by the method of the present invention. According to the method of the present invention, since it is possible to achieve stereoselective very high condensation efficiency, to be capable of producing a oligoribonucleosides phosphorothioates long chain in high yield by applying to the solid phase method Become. Is a diagram showing the HPLC profile of the resulting phosphorothioate RNA4 mer in Example 6. Is a diagram showing the HPLC profile of the resulting phosphorothioate RNA2 mer in Example 6. Is a diagram showing the HPLC profile of the resulting phosphorothioate RNA12 mer in example 7. It is a graph showing the results of examining the enzyme resistant phosphorothioate RNA 12-mer. All- (Rp) and (Sp) - (CpsApsGpsU) is a diagram showing the melting curve of 3 -r (ApoCpoUpoG) 3. It is a diagram showing the HPLC profile of the resulting phosphorothioate RNA 12-mer in example 12. In the general formula (I) R 1 represents a hydrogen atom or a protecting group of a hydroxyl group. Type of the protective group for a hydroxyl group is not particularly limited, in general, the acetyl protecting group such as an acetyl group or a phenoxyacetyl (Pac), the benzyl protecting group such as a benzyl group or a 4-methoxybenzyl group, a benzoyl group, pivaloyl group, 4,4'-trityl protecting groups such as dimethoxytrityl group (DMTr), silyl protecting groups such as trimethylsilyl group (TMS) and Tert- butyldimethylsilyl (TBDMS), 2-(cyano) ethyl group (CEE ) and cyano ethoxymethyl group (CEM) may be any appropriate protecting group such as an ether protecting group such as. Green et al. For the protecting group of the hydroxyl group, Protective Groups in Organic Synthesis, 3rd Edition, 1999, John Wiley & Sons, reference can be made to the textbooks, such as Inc.. When the R 1 is a protecting group, as the protecting group or other protecting groups in the synthesis process can be selectively eliminated, the protecting group of R 1 is a protecting group different from other protecting groups it is preferable that. The protecting group R 1, for example, it is preferable to use a trityl protecting group, it is more preferable to use 4,4'-dimethoxytrityl group. Bs represents a nucleic acid base which may have a protecting group. Adenine The nucleobase, uracil, thymine, guanine, and other nucleobase selected from the group consisting of cytosine, may use any modified base, such as ribothymidine and 5-methyluridine. Preferably, it can be used adenine RNA structure base, uracil, guanine, and a nucleobase selected from the group consisting of cytosine. Nucleobases can be coupled to the ribose in the normal binding site becomes residues. Bs in the other formula is also the same as described above. If the nucleobase having a protecting group, the kind of the protecting group is not particularly limited, when using a nucleobase having an amino group may be protected amino group. For example, it may adenine nucleobase having an amino group, can be protected guanine, and an amino group of cytosine preferred, as the protecting group, for example benzoyl, 4-methoxybenzoyl group, an acetyl group, a propionyl group, a butyryl group, isobutyryl group, phenylacetyl group, phenoxyacetyl group, 4-tert-butyl-phenoxyacetyl, 4-isopropyl phenoxyacetyl group, or the like can be used (dimethylamino) methylene group. Bs in the other formula is also the same as described above. General formula (I) n + 2 pieces of Bs ribonucleoside phosphorothioate or its salt has represented by may each be the same or different. n represents 0 or an integer of 1 or more, preferably n is 100 an integer, more preferably 50 or less integer, more preferably 40 or less integer. In general formula (I), a divalent group represented by the n's X each independently of the above general formula (II-Sp) or (II-Rp), in the same manner as described above n number of Bs included in the n X may have respectively the same or different. R 2 is a hydrogen atom or a cyano ethoxymethyl group, compounds wherein R 2 is a hydrogen atom, after the synthesis method of the present invention R 2 is manufactured ribonucleoside phosphorothioate is cyano ethoxymethyl group, cyano ethoxymethyl it can be produced by leaving a group. Formula kind of the salt of ribonucleoside phosphorothioate of the formula (I) is not particularly limited, for example, addition salts of the ammonium salt or an organic amine, preferably, sodium salts, potassium salts, metal salts such as magnesium salt, more preferably, the like can be used and sodium salts of tertiary alkyl amine compounds such as ammonium salts and triethylamine salts. Ribonucleoside phosphorothioate or a salt thereof represented by the general formula (I) may be in the form of hydrates or solvates. Formula stereoscopic representation in ribonucleosides phosphorothioates represented by (I) show the absolute configuration, by the method of the present invention, the general formula to produce a ribonucleoside phosphorothioates optical antipodes of the formula (I) also possible it is. Ribonucleoside phosphorothioates represented by the general formula (I), relative to the compound represented by the formula (III), oxa The phosphorylase Jin ribonucleic represented by the above general formula (IVa) or (IVb) It may be prepared by sulfiding a nucleoside after condensation. In the general formula (III) indicates a protecting group for a hydroxyl group in R 3 and R 4 each independently. Hydroxyl protecting groups are as described above, can be selected an appropriate protective group according to the purpose, the protecting group R 3 and R 4 represents may be the same or different. Further, when the solid phase method can be a solid support attached via either one is optionally a linker of R 3 and R 4. In this case, it is possible to use a protecting group of general hydroxyl group and the remaining one. Type of solid phase carrier is not particularly limited, it is possible to use any of the solid support as long as it can be used as a solid phase carrier in the synthesis of nucleic acid derivatives. The type and length of the linker is not particularly limited, those skilled in the art can be selected appropriately. For example solid carriers Teiana glass (controlled pore glass: CPG), oxalyl reduction - Teiana glass (. Nucleic Acids Res, 19, 1527, etc. 1991), TentaGel support - amino polyethylene glycol derivatization support (Tetrahedron Letters , 34, 3373, 1993, etc. ), Poros- polystyrene / including copolymers of divinylbenzene can be mentioned, particularly preferred highly crosslinked aminomethyl polystyrene as the solid phase support (highly cross-linked polystyrene: HCP, Tetrahedron Letters, 32, 4096, 1991), or the like can be used. Linkers, for example, 3-aminopropyl group, succinyl group, 2,2'-diethanol sulfonyl group, and the like long chain alkyl amino group (LCAA). Although R 5 in the oxa The phosphorylase Jin ribonucleoside represented by the general formula (IVa) or (IVb) shows a protecting group for a hydroxyl group, the hydroxyl-protecting group is as described above, the appropriate according to the purpose it can be selected protecting group. For example it is preferable to use trityl protecting group, it is more preferable to use 4,4'-dimethoxytrityl group. R 6 represents an aryl group which may have a substituent. The aryl group can have a single ring or condensed polycyclic aryl group, but can be preferably used a phenyl group. The phenyl group an alkyl group, an alkoxy group, a substituent such as a halogen atom may be present one or more. It can be preferably used an unsubstituted phenyl group as R 6. The condensation reaction and the sulfurization reaction described above J. Am. Chem. Soc., 130, pp.16031-16037, 2008, Org. Lett., 11, pp.967-970, 2009, and described in WO2005 / 92909 it can be carried out with reference to the conditions. Included in this disclosure by reference for all disclosure of the above patent document (WO2005 / 92909). The condensation reaction can be carried out in the presence of an activating agent in order to enhance the efficiency of the condensation reaction. The type of activator is not particularly limited, the method of the present invention is extremely due to its high reactivity, for example low nucleophilicity N- (cyanomethyl) pyrrolidinium triflate (CMPT) stereoselectivity be used like a significant improvement of the condensation efficiency can be achieved without compromising. Also, a nucleophilic highly activator N- phenyl-imidazolium triflate high stereoselectivity be used (PhIMT) is obtained, the long-chain oligoribonucleosides phosphorothioates containing four nucleobases obtain a sufficient applicable high condensation efficiency synthesis. Although sulfurizing agent is also not particularly limited, it can be used, for example dimethyl disulfide (DTD). In the above method, although a divalent radical or (II-Rp) divalent group represented by the represented by the (n + 1) X (II-Sp) can be combined in any number, all the n + 1 X is (II-Sp) with or is a divalent group represented, or all (II-Rp) in the general formula is a divalent group represented (I) it is preferable to produce a ribonucleoside phosphorothioates. Relative to the compound represented by the above formula (III), general formula by sulfide oxa The phosphorylase Jin ribonucleoside represented by the above general formula (IVa) or (IVb) after condensation (I after producing ribonucleosides phosphorothioates represented by), the resulting ribonucleosides phosphorothioates as starting material by condensation of oxa the phosphorylase Jin ribonucleoside represented by the above general formula (IVa) or (IVb) by sulfide after, it is possible to manufacture a compound having increased one ribonucleoside phosphorothioate units (X), using a further resultant compound as a starting material, by the general formula (IVa) or (IVb) by sulphurizing oxa the phosphorylase Jin ribonucleoside represented after condensation, one further increases the ribonucleoside phosphorothioate units (X) It can be. By repeating this reaction, it is possible to produce a ribonucleoside phosphorothioate represented by the general formula (I) having the desired n + 1 ribonucleoside phosphorothioate units (X). Production of ribonucleosides phosphorothioates by repeating the above can preferably be carried out by solid phase method. It is also possible to carry out the synthesis using an automated synthesizer by applying the oligo nucleic acid synthesis method by solid-phase method. Solid can utilize a variety of documents with respect to phase, it is possible to select the appropriate conditions by those skilled in the art readily. For example, can be appropriately selected as long cut condition from capped and the solid phase carrier in performing the solid-phase method also by those skilled in the art. Deprotection of cyano ethoxymethyl group can be carried out selectively by tetrabutylammonium fluoride (TBAF) (Nucleic Acids Res., 35, pp.3287-3296, 2007). For acrylonitrile-produced during the deprotection can be inhibited from adding to the nucleobase, the deprotected in a high yield by suppressing the side reaction by adding a small amount of nitromethane as a scavenger of acrylonitrile (e.g., about 0.5%) it can be carried out. Following is a more detailed description of the present invention through examples, the scope of the present invention is not limited to the following examples. N 2 - phenoxyacetyl -3 ', 5'-O- (tetraisopropyldisiloxane-1,3-diyl) -2'-O- (2- cyano ethoxymethyl) guanosine (11.175 g, 14.9 mmol) in toluene, It was dichloromethane solution (100 ml) and dried by repeated azeotropic distillation with dichloromethane. N, N-dimethylaminopyridine (DMAP, 0.092 g, 0.75 mmol), triethylamine (8.3 ml, 59.6 mmol) and mesitylene sulfonyl chloride (3.920 g, 17.9 mmol) and the mixture was stirred for 30 minutes at room temperature. The reaction mixture was washed with saturated aqueous sodium bicarbonate solution (30 ml x 3), extracted and the combined washings with dichloromethane (30 ml x 2). The organic layer was dried over anhydrous sodium sulfate, filtered, and concentrated under reduced pressure. The residue was toluene, dichloromethane solution was dried by repeated azeotropic distillation with dichloromethane and (100 ml). It was cooled to 0 ° C., was added N- methyl Mori holin a (15.9 ml, 149 mmol), and stirred for 20 minutes with a 0 ° C.. To 2-cyano ethanol (10.1 ml, 149 mmol), 1,8- diazabicyclo [5,4,0] undec-7-ene (BDU, 3.3 ml, 22.1 mmol) and the mixture was stirred for 25 min at 0 ℃ after the addition of 1 M KH 2 PO 4 aqueous solution (50 ml). The organic layer was separated, washed with 1 M KH 2 PO 4 aqueous solution (50 ml x 2), and extracted the combined washings with dichloromethane (30 ml x 2). The organic layer was dried over anhydrous sodium sulfate, filtered, and concentrated under reduced pressure. The residue was purified by silica gel column chromatography [200 g silica gel, ethyl acetate - hexane (50:50, v / v → 100: 0, v / v)] was purified by. This was washed with saturated aqueous sodium bicarbonate solution (30 ml x 3), extracted and the combined washings with dichloromethane (30 ml x 2). The organic layer was dried over anhydrous sodium sulfate, and filtered to give the desired compound (6.200 g, 52%) by concentrating under reduced pressure. Colorless amorphous. O 6 - cyanoethyl -N 2 - phenoxyacetyl -3 ', 5'-O- and (di-tert-butyl silane diyl) -2'-O- (2- cyano ethoxymethyl) guanosine (5.280 g, 6.6 mmol) toluene was tetrahydrofuran solution with (35 ml) and dried by repeated azeotropic distillation with tetrahydrofuran. This was heated to 35 ° C., triethylamine · 3HF (1.3 ml, 8.0 mmol) carefully, and the mixture was stirred for 4.5 hours while the 35 ° C.. After cooling to 0 ° C., water and 5 ml was added and the reaction mixture was stirred for 1 hour while the 0 ° C.. After the tetrahydrofuran reaction mixture was evaporated under reduced pressure, diethyl ether was added 7.5 ml, and stirred at room temperature for 1 hour. The resulting precipitate was collected by suction filtration, washed with diethyl ether (3 ml x 3), and the solvent was evaporated under reduced pressure. Obtained This was recrystallized from methanol (40 ml), those obtained were washed with diethyl ether (3 ml x 3), the desired product by distilling off the solvent under reduced pressure the (2.105 g, 57%) It was. Colorless amorphous. (c) O 6 - cyanoethyl -N 2 - phenoxyacetyl -5'-O- (4,4'- dimethoxytrityl) -2'-O- (2- cyano ethoxymethyl) guanosine O 6 - cyanoethyl -N 2 - phenoxyacetyl -2'-O- (2- cyano ethoxymethyl) guanosine (1.633 g, 3.0 mmol) was pyridine solvent and dried (10 ml) by repeated azeotropic distillation with pyridine. It was cooled to 0 ° C., it was added 4,4'-dimethoxytrityl (DMTr) chloride (1.197 g, 3.5 mmol) and. After stirring for 2 hours while returning to room temperature, add methanol (5 ml), the solvent was distilled off under reduced pressure to obtain a chloroform solution (50 ml). This was washed with a saturated aqueous sodium bicarbonate solution (30 ml x 3), the combined washings were extracted with chloroform (20ml x 3). The organic layer was dried over anhydrous sodium sulfate, filtered, and concentrated under reduced pressure. The residue was purified by silica gel column chromatography [55 g of silica gel, ethyl acetate - hexanes - pyridine (25: 75: 0.5, v / v / v → 100: 0: 0.5, v / v / v)] Purpose be purified by to give an object (2.467 g, 98%). Colorless amorphous. 5'-O- (4,4'- dimethoxytrityl) -2'-O- (2- cyano ethoxymethyl) uridine (0.630 g, 1.0 mmol) of pyridine, tetrahydrofuran and dried by repeated azeotropic toluene and a solution (5 ml). To this triethylamine (1.0 ml, 7.1 mmol) was added, - after cooling to 78 ℃, (4S, 5R) - oxa The phosphoryl Jinkuro 0.5 M tetrahydrofuran solution (6 ml, 3.0 mmol) in Lido a - 78 ° C. Carefully remain It was dropped in. After stirring for 1.5 hours while returning to room temperature, diluted with chloroform (400 ml), was added a saturated aqueous sodium bicarbonate solution (100 ml). The organic layer was separated, washed with saturated aqueous sodium bicarbonate solution (100 ml x 2), the combined washings were extracted with chloroform (30 ml x 2). The organic layer was dried over anhydrous sodium sulfate, filtered, and concentrated under reduced pressure. The residue was purified by silica gel chromatography [15 g NH silica gel, toluene - ethyl acetate - triethylamine (60: 40: 0.1, v / v / v)] was purified by. Fractions containing the desired product was washed with a saturated aqueous sodium bicarbonate solution (100 ml), the organic layer was dried over anhydrous sodium sulfate, and filtered to give the desired compound (0.520 g, 62%) by concentrating under reduced pressure . Colorless amorphous. (b) N 6 - acetyl -5'-O- (4,4'- dimethoxytrityl) -3'-O - [(2R , 4S, 5R) -5- phenyl - tetrahydro-1H, 3H-pyrrolo [1 , 2-c] -1,3,2- oxa The phosphoryl-2-yl] -2'-O- (2- cyano ethoxymethyl) adenosine [(Rp)]. N 6 - acetyl -5'-O- (4,4'- dimethoxytrityl) -2'-O- (2- cyano ethoxymethyl) adenosine (0.695 g, 1.0 mmol) in triethylamine (1.0 ml, 7.1 mmol), (4S, 5R) - oxa the phosphoryl Jinkuro Lido 0.5M tetrahydrofuran solution (6 ml, 3.0 mmol) were added and stirred at room temperature for 2 hours. The residue was purified by silica gel chromatography [25 g NH silica gel, toluene - ethyl acetate - triethylamine (20: 10: 0.03, v / v / v)] to obtain the desired product by purification by a (0.443 g, 49%). Colorless amorphous. (c) N 4 - acetyl -5'-O- (4,4'- dimethoxytrityl) -3'-O - [(2R , 4S, 5R) -5- phenyl - tetrahydro-1H, 3H-pyrrolo [1 , 2-c] -1,3,2- oxa The phosphoryl-2-yl] -2'-O- (2- cyano ethoxymethyl) cytidine [(Rp)]. N 4 - acetyl -5'-O- (4,4'- dimethoxytrityl) -2'-O- (2- cyano ethoxymethyl) cytidine (1.010 g, 1.5 mmol) in triethylamine (1.5 ml, 10.5 mmol), (4S, 5R) - oxa the phosphoryl Jinkuro Lido 0.5M tetrahydrofuran solution (9.0 ml, 4.5 mmol) was added and stirred at room temperature for 1.5 hours. The residue was purified by silica gel chromatography [crude product 0.30 g, 3.0 g NH silica gel, hexane - ethyl acetate - triethylamine (20: 10: 0.03, v / v / v → 10: 30: 0.04, v / v / v)], [crude product 0.30 g, 3.0 g NH silica gel, hexane - ethyl acetate - triethylamine (20: 10: 0.03, v / v / v → 10: 20: 0.03, v / v / v)] and [crude product 1.23 g, 12.3 g NH silica gel, hexane - ethyl acetate - triethylamine (20: 10: 0.03, v / v / v → 10: 20: 0.03, v / v / v)] the desired product by purification by (0.693 g, 53%) was obtained. Yellow amorphous. (d) O 6 - cyanoethyl -N 2 - phenoxyacetyl -5'-O- (4,4'- dimethoxytrityl) - 3'-O - [( 2S, 4R, 5S) -5- phenyl - tetrahydro - IH, 3H-pyrrolo [1,2-c] -1,3,2- oxa The phosphoryl-2-yl] 2'-O- (2- cyano ethoxymethyl) guanosine [(Rp)]. O 6 - cyanoethyl -N 2 - phenoxyacetyl-5'-O-(4,4'-dimethoxytrityl) -2'-O-(2-cyano ethoxymethyl) guanosine (0.856 g, 1.0 mmol) in triethylamine (1.0 ml, 7.1 mmol), (4S, 5R) - oxa the phosphoryl Jinkuro Lido 0.5M tetrahydrofuran solution (6.0 ml, 3.0 mmol) were added and stirred at room temperature for 2 hours. The residue was purified by silica gel chromatography [20 g NH silica gel, toluene - ethyl acetate - triethylamine (80: 20: 0.1, v / v / v)] to obtain the desired product by purification by a (0.447 g, 42%). Colorless amorphous. In the same manner as in Example 2 4R, the following compounds were synthesized using 5S- oxa The phosphoryl Jinkuro chloride. (A) 5'-O- (4,4'- dimethoxytrityl) -3'-O - [(2S, 4R, 5S) -5- phenyl - tetrahydro-1H, 3H-pyrrolo [1,2-c] 1,3,2-oxa The phosphoryl-2-yl] -2'-O- (2- cyano ethoxymethyl) uridine [(Sp)]. 5'-O- (4,4'- dimethoxytrityl) -2'-O- (2- cyano ethoxymethyl) uridine (0.944 g, 1.5 mmol) in triethylamine (1.5 ml, 10.5 mmol), 4R, 5S- oxa 0.5M tetrahydrofuran solution (9.3 ml, 4.7 mmol) in tHE phosphoryl Jinkuro chloride, and the mixture was stirred for 1.5 hours at room temperature. The residue was purified by silica gel chromatography [crude product 0.30 g, 3 g NH silica gel, hexane - ethyl acetate - triethylamine (20: 10: 0.03, v / v / v → 10: 10: 0.02, v / v / v)], [crude product 1.40 g, 5.5 x 27 cm, 3.0 g NH silica gel, hexane - ethyl acetate - triethylamine (20: 10: 0.03, v / v / v → 10: 20: 0.03, v / v / v)] by the desired product was obtained (0.900 g, 71%) by purification. Colorless amorphous. N 6 - acetyl -5'-O- (4,4'- dimethoxytrityl) -2'-O- (2- cyano ethoxymethyl) adenosine (0.698 g, 1.0 mmol) in triethylamine (1.0 ml, 7.1 mmol), (4R, 5S) - oxa the phosphoryl Jinkuro Lido 0.5M tetrahydrofuran solution (6.0 ml, 3.0 mmol) were added and stirred at room temperature for 2 hours. The residue was purified by silica gel chromatography [13 g NH silica gel, toluene - ethyl acetate - triethylamine (50: 50: 0.1, v / v / v)] to obtain the desired product by purification by a (0.462 g, 51%). Colorless amorphous. (c) N 6 - acetyl -5'-O- (4,4'- dimethoxytrityl) -3'-O - [(2R , 4S, 5R) -5- phenyl - tetrahydro-1H, 3H-pyrrolo [1 , 2-c] -1,3,2- oxa The phosphoryl-2-yl] -2'-O- (2- cyano ethoxymethyl) cytidine [(Sp)]. N 4 - acetyl -5'-O- (4,4'- dimethoxytrityl) -2'-O- (2- cyano ethoxymethyl) cytidine (0.671 g, 1.0 mmol) in triethylamine (1.0 ml, 7.1 mmol), (4R, 5S) - oxa the phosphoryl Jinkuro Lido 0.5M tetrahydrofuran solution (6.0 ml, 3.0 mmol) was added and stirred at room temperature for 1.5 hours. The residue was purified by silica gel chromatography [14 g NH silica gel, toluene - ethyl acetate - triethylamine (10: 20: 0.03, v / v / v)] to obtain the desired product by purification by a (0.655 g, 75%). Yellow amorphous. (d) O 6 - cyanoethyl -N 2 - phenoxyacetyl -5'-O- (4,4'- dimethoxytrityl) -3'-O - [(2R , 4S, 5R) -5- phenyl - tetrahydro -1H , 3H- pyrrolo [1,2-c] -1,3,2- oxa The phosphoryl-2-yl] 2'-O- (2- cyano ethoxymethyl) guanosine [(Sp)]. O 6 - cyanoethyl -N 2 - phenoxyacetyl-5'-O-(4,4'-dimethoxytrityl) -2'-O-(2-cyano ethoxymethyl) guanosine (1.280 g, 1.5 mmol) in triethylamine (1.5 ml, 10.5 mmol), 4R, 5S- oxa the phosphoryl Jinkuro chloride 0.5M tetrahydrofuran solution (9.0 ml of, 4.5 mmol) was added and stirred at room temperature for 1.5 hours. The residue was purified by silica gel chromatography [crude product 0.30 g, 3.0 g NH silica gel, hexane - ethyl acetate - triethylamine (30: 10: 0.04, v / v / v → 10: 20: 0.03, v / v / v)], [crude product 1.5 g, 15 g NH silica gel, hexane - ethyl acetate - triethylamine (30: 10: 0.04, v / v / v → 10: 20: 0.03, v / v / v)] purpose be purified by to give an object (0.865 g, 54%). Colorless amorphous. Example is the reaction of 2 and 3 were obtained in the ribonucleoside-oxa The phosphorylase Jin are both high diastereoselectivity of the object. (A) (Rp) - or (Sp) - using ribonucleoside oxa The phosphorylase Jin as a monomer unit, and stereoselectively solid phase synthesis of phosphorothioate RNA2 mer. The reaction steps are shown below. CPG as the solid phase carrier, using a succinyl linker as a linker, after the 5'-hydroxyl group and monomer units of uridine on a solid support by condensing at CMPT a nucleophilic small activator, the resulting phosphite sulfurized with DTD, concentrated ammonia - ethanol (3: 1, v / v) in excised from the treated solid phase carrier, stereoselectively by deprotection of the protecting group of the chiral auxiliary and a nucleic acid base moiety a dimer was synthesized. It was analyzed by RP-HPLC, leaving the CEM group for the purpose of facilitating the determination of dimer was calculated condensation efficiency and diastereoselectivity. As a result, a sufficiently applicable for high condensation efficiency oligomer synthesis and condensation reaction at a high diastereoselectivity was confirmed to proceed. Further, this reaction is complete condensation reaction in about 5 minutes, it is extremely high reactivity than as took 15 minutes to condensation of dimer in the conventional reaction using a TBDMS group was confirmed . (b) in the same manner as in the above (a), phosphorothioate RNA4 mer (All- (Rp) - [Ups ] 3 U, All- (Sp) - [Ups] 3 U, All- (Rp) -ApsGpsCpsU, and All- the (Sp) -ApsGpsCpsU) was synthesized. The reaction steps are shown below. After condensed with an activating agent CMPT, and capped with the unreacted 5'-hydroxyl group, an amino group, respectively trifluoroacetyl imidazole asymmetric auxiliary group (CF 3 CO-Im). With capped to inhibit the synthesis of other than the sequence of interest, the amino group of the chiral auxiliary group to lower the basicity by acylation was carried out for the purpose of holding the acidity of the reaction system. Subsequently, sulfurization of phosphites by DTD, performs removal of DMTr group of 5'-end (3% DCA), was further condensed monomer units. It was synthesized phosphorothioate tetramer having the nucleotide sequence of interest by repeating a series of chain length elongation cycle. Finally concentrated ammonia - ethanol (3: 1, v / v) cut from the solid phase support under basic conditions, was removed of the protective group. The results shown in Table 3 below. For comparison, the average condensation efficiency in the case of performing the synthesis of All- (Rp) -ApsGpsCpsU using CMPT similarly 2'hydroxyl protecting group as TBDMS group by a conventional method was 77%. All- as phosphorothioate RNA12 dimers in the same manner as (c) above (Rp), (Sp) - was synthesized [Ups] 11 U. The reaction steps are shown below. 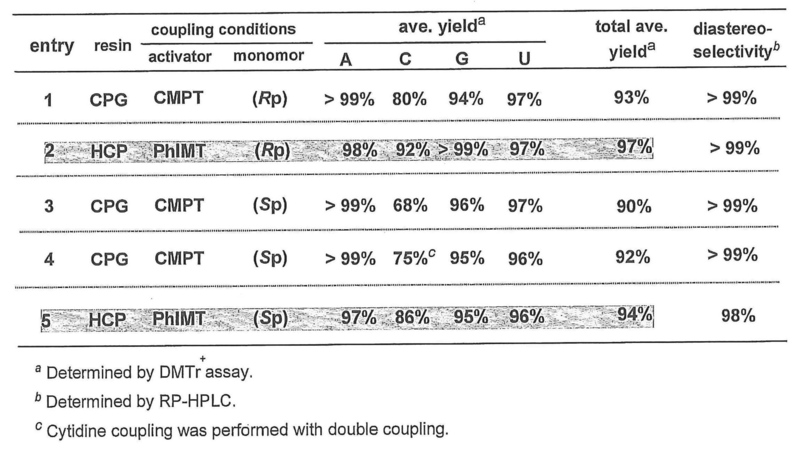 After synthesis, the average condensation yield calculated from DMTr quantification was 99% to Rp body, Sp body both. Even if the synthesis of RNA oligomers with a nucleophilic small CMPT, good average condensation efficiency was obtained. Concentrated ammonia -EtOH (3: 1, v / v) at 4 hours to was cut out oligomers from the solid support, the solid support was removed by filtration and deprotection of the protecting group with ammonia process again . It was then analyzed by RP-HPLC in a state where the solvent of the reaction solution was distilled off to about 2ml leaving the CEM group and DMTr group. Preparative main peak seems to be the desired product minute and purified, was desalted by repeated 3 times freeze dried with sterile water, deprotection of the CEM group and 5 hours treated with 0.5 M TBAF solution was added 0.5% nitromethane did. To remove TBAF by Sep-Pak purification and the solvent was removed by lyophilization. Was subsequently deprotected DMTr group was treated for 1 hour with 80% acetic acid solution. Desalted by Sep-Pak purification and purification on a main peak seems to be the desired product divided by RP-HPLC, desalted by repeating 3 times the lyophilized under sterile water to obtain the desired product. Carried out identified by MALDI-TOF-MAS, it was confirmed that the target compound. Containing four nucleobases All- (Rp), (Sp) - were synthesized (CpsApsGpsU) 3. DMTr result of calculating the average condensation efficiency by quantitative, average condensation efficiency Rp body 90% and a Sp 93%. After purification fractionated by main peaks of RP-HPLC, the CEM group was removed by TBAF, was confirmed to be the desired product by MALDI-TOF-MAS. MALDI-TOF-MASS: m / z calcd for C 114 H 141 N 45 O 71 P 11 S 11 - [(M - H) -] 3968.29, found 3970.75. All- (Sp) - [Ups] Since the reason why the isolated yield is lower than the production of 11 U was estimated to be in the low reactivity of the cytidine monomer, a condensation reaction using cytidine monomer 2 by repeated times All- (Rp) - (CpsApsGpsU) 3 a was synthesized in the same manner (cytidine double coupling for monomer, 15 min x 2), condensation efficiency of the cytidine monomer is improved about 10%, respectively, DMTr + the average condensation yield of 12 mer which is calculated from the quantification was improved to 92%. After purification fractionated by main peaks of RP-HPLC, the CEM group was removed by TBAF, was confirmed to be the desired product by MALDI-TOF-MAS. MALDI-TOF-MASS: m / z calcd for C 114 H 141 N 45 O 71 P 11 S 11 - [(M - H) -] 3968.29, found 3969.15. Example 6: Aiming the application as RNAi pharmaceutical studies phosphorothioate RNA activator, when considering the mass production with a nucleic acid automatic synthesizer, double couplings can not be said to be a practical way, also resulting condensation efficiency also insufficient RNA oligomer synthesis, must have to further improve the reactivity of the cytidine monomer. For the purpose of improving the condensation reaction efficiency cytidine monomer units, it was examined activating agent used in the condensation reaction. Study of the active agent, in a previous study that was introduced TBDMS group in 2'-hydroxyl group, a high condensation efficiency achieved by being acid-azole complex N- phenyl triflate (PhIMT) as an activator the model array All- (Rp) -CpsCpsCpsU 4 tetramer was carried out by combining. A tetramer of high nucleophilic PhIMT as an activator were synthesized. The HPLC profiles are shown in Figure 1. After synthesizing the tetramer, the average condensation efficiency 89% calculated from DMTr quantitative and, condensation efficiency is greatly improved as compared to the nucleophilic small CMPT, sufficient adaptable good reactivity to the oligomer synthesis It is shown (entry 2). However, since PhIMT is highly nucleophilic activator, there is a possibility that epimerization proceeds. Accordingly, next, to synthesize UpsU 2 mers PhIMT as an activator, was estimated stereoselectivity of each diastereomer. The HPLC profile of the dimer shown in Fig. The PhIMT as an activator (Rp), by combining the (Sp) -UpsU 2 dimer was calculated stereoselectivity during the condensation reaction. Stereoselectivity, the retention time when analyzed by RP-HPLC, was estimated to identify diastereomers. As a result, stereoselectivity obtained from Area value of HPLC profile is 98.0% at Rp body was 99.7% for Sp body. (Entry 1-2) In this synthesis conditions and protecting groups CEM group were found to express good stereoselectivity. From the above conditions studied, by using PhIMT as an activator, improved condensation reaction efficiency, it was found to express good stereoselectivity. The results were that the idea is sufficient to apply to the RNA oligomer synthesis, then PhIMT as an activator to synthesize four kinds of RNA oligomers that contain nucleobases. Example 7: PhIMT was with an activator All- (Rp), (Sp) - is (CpsApsGpsU) 3 12-mer results of examining the activator in the synthesis condensation reaction, nucleophilic highly activator with PhIMT, reactivity greatly improved cytidine monomer unit expressed sufficiently adaptable condensation efficiency RNA oligomer synthesis, stereoselectivity. Therefore, by changing the activator from CMPT to PhIMT, it was phosphorothioate RNA oligomer synthesis containing four nucleobases. The PhIMT as an activator, All- (Rp), (Sp ) - (CpsApsGpsU) was subjected to solid phase synthesis of 3 12-mer. The HPLC profiles of the obtained 12-mer shown in Fig. As a result, Rp body, the Sp body both the condensation reaction efficiency in the cytidine introduction process, has succeeded in improving by about 10% (Table 7: entry2, 5). Then, a peak appears to target compound was prep purified by RP-HPLC, repeated 3 times freeze dried with sterile water. Or, in the case of using PhIMT a nucleophilic highly active agents, that cytidine reactive monomer is greatly improved, a phosphorothioate RNA oligomers with a very good condensation efficiency stereoselectively synthesizable It was shown. Thus, the reactivity of the cytidine monomer units is not only the basicity of the base site, it was found to vary greatly depending on the steric environment of the 2'-hydroxyl group. To obtain sufficient condensation reaction efficiency in phosphorothioate RNA oligomer synthesis with nucleophilic highly active agents, that the use of sterically small CEM group as a protecting group of the 2'-hydroxyl group is critical It was shown. Example 8: All-synthetic phosphorothioate RNA 12-mer as deprotection phosphorothioate RNA12 mer (Rp), (Sp) - (CpsApsGpsU) 3 12 The dimer was synthesized. After synthesis, the average condensation yield calculated from DMTr quantification, Rp body 94%, Sp isomer was 97%. By performing the synthesis of RNA oligomers with PhIMT a nucleophilic highly activators, good average condensation efficiency was obtained. Concentrated ammonia -EtOH (3: 1, v / v) 4 hours to after the cut from the solid support oligomers, the solid phase support is removed by filtration, deprotecting the protecting group by the ammonia treatment again did. It was then analyzed by RP-HPLC in a state where the solvent of the reaction solution was distilled off to about 2ml leaving the CEM group and DMTr group. Preparative main peak seems to be the desired product minute and purified, was desalted by repeated 3 times freeze dried with sterile water, deprotection of the CEM group was 5 hours at 0.5M TBAF solution was added 0.5% nitromethane did. To remove TBAF by Sep-Pak purification and the solvent was removed by lyophilization. Was subsequently deprotected DMTr group was treated for 1 hour with 80% acetic acid solution. Desalted by Sep-Pak purification and purification on a main peak seems to be the desired product divided by RP-HPLC, desalted by repeating 3 times the lyophilized under sterile water to obtain the desired product. Carried out identified by MALDI-TOF MAS, it was confirmed that it was the desired product. Solid phase synthesis in the above reaction the following steps (i) - was performed by repeating (viii). Condensation time was 15 min for out of 5 min, 4-mer in the dimer [Ups] 3 U in 10 min, ApsGpsCpsU in 15 min, 12 mer. Capping was performed at 4 mer, the synthesis of 12 mer. After chain length elongation by repeating the steps, the ammonia treatment was performed in a state in which 5'-O-DMTr group was left state or removed. Removal of 5'-O-DMTr group was performed by 3% DCA / dichloromethane (15 s x 4) processing, and washed with dichloromethane. Then concentrated ammonia - ethanol (3: 1, v / v) (6 ml) was added, and the mixture was sealed, 3 hours for the dimer, 8 hours or 12 hours for tetramer, about 12 mer It was carried out for 48 hours ammonia treatment. Dimer, 4 For the dimers, After distilling off the ammonia, sterile water was added to the ones and lyophilized, RP-HPLC was filtered (Senshu-Pak C18; 2 dimer condition A, 4-mer were analyzed by the conditions B). For the 12-mer, it was distilled off under reduced pressure until the solution was approximately 2 ml, RP-HPLC (Senshu-Pak C18 or Waters C18; 12-mer condition C or condition D) were analyzed by. Tetramer, for the 12-mer, performed by preparative purification by RP-HPLC, after performing the desalting by repeating 3 times the lyophilized using residue sterile water, 0.5% with respect to tetramer CH 3 NO 2 to 0.5 M TBAF / DMSO was stirred at room temperature for 4 hours at (1.0 ml) solution was added, 0.5 with respect to 12-mer was added 0.5% CH 3 NO 2 M TBAF / DMSO (400 μl) solution in and stirred at room temperature for 5 hours. 0.1 M TEAA buffer (pH 7) stops (40 ml) were added and the reaction, tetramer RP-HPLC with respect to (Senshu-Pak C18; condition B), with respect to 12-mer RP-HPLC (Senshu-Pak C18 or Waters C18; were analyzed by condition D). Use reverse phase HPLC (RP-HPLC) The PEGASIL ODS 5 μm column (120Å, 4.0 mm × 150 mm) (Senshu Pak) or μBondasphere C18 5μm column (100 A, 3.9 mm × 150 mm) and (Waters) as a column It had. Conditions as elution conditions A (0-20% acetonitrile /0.1 M triethylammonium acetate (TEAA) buffer (pH 7.0), 30 ℃, 60 min, 0.5 mL / min), the condition B (0-30% acetonitrile /0.1 M triethyl ammonium acetate (TEAA) buffer (pH 7.0), 30 ℃, 90 min, 0.5 mL / min), the condition C (0-25% acetonitrile /0.1 M TEAA buffer (pH 7.0), 30 ℃, 75 min, 0.5 mL / min, condition D (0-75% acetonitrile /0.1 M TEAA buffer (pH 7.0), 30 ℃, 75 min, 0.5 mL / min) and condition E (0-30% acetonitrile /0.1 M TEAA buffer (pH 7.0), 30 ℃, 60 min, was used 0.5 mL / min). For the 12-mer was carried out desalted by elution with 80% aqueous acetonitrile using a Sep-Pak (registered trademark) tC18. After lyophilization of the solution containing the obtained 12-mer, it was stirred at room temperature for 1 hour with 80% acetic acid solution. 2M TEAA buffer (pH 7) was added (20ml) was then stopped and the reaction was performed Sep-Pak desalted by elution with 40% aqueous acetonitrile using (R) tC18. After the acetonitrile and the resulting solution was evaporated under reduced pressure, RP-HPLC (Senshu-Pak C18 or Waters C18; condition D) were analyzed by. 12-mer and preparative purification by RP-HPLC, was desalted repeated three times lyophilized under sterile water to obtain an RNA oligomer of interest. The resulting RNA oligomer was identified intended product MALDI-TOF-MASS. It was studied deprotection conditions of the CEM group. Although CEM group is selectively removed by TBAF, there are cases where the desulfurization of phosphorothioate is observed several percent during the deprotection reaction by TBAF. This is because the residue of the chiral auxiliary group acts as a catalyst is believed that that promotes desulfurization reaction. By performing the preparative purification by RP-HPLC, since the desulfurization can be significantly suppressed, and subjected to deprotection reaction after preparative purification tetramer. Literature (Nucleic Acids Res., 35, pp.3287-3296, 2007) was deprotected CEM group by treatment with 0.5M TBAF in accordance with the method described. At that time, acrylonitrile which is a by-product during the de-CEM reaction was added nitromethane 0.5% in order to prevent the added to the nucleic acid base moiety. Was analyzed by RP-HPLC after deprotection reaction, deprotection reaction is proceeded quantitatively, side reactions such as modification or desulfurization of the nucleic acid base moiety was observed. Example 10: The enzymatic degradation by enzymes resistant NP1 phosphorothioate RNA, isolated and purified (CpsApsGpsU) 3 12-mer (1.0 nmol), nP1 (1 unit), 50mM CH 3 COONa, an aqueous solution containing 1 mM ZnCl 2 (20 [mu] l, and constant temperature left at pH 7.2) 16h, 37 ℃. After addition of 0.1 M TEAA buffer (pH 7) (80 μl), 1 min isothermal left to deactivate the enzyme at 100 ° C.. After filtration of the residue, RP-HPLC (Senshu-Pak C18 or Waters C18; condition E) were analyzed by. For enzymatic degradation by the SVPDE, isolated and purified (CpsApsGpsU) 3 12-mer (1.0 nmol), SVPDE (0.1 x 10 -3 unit), 100mM Tris-HCl, aqueous solution containing 15mM MgCl 2 (20 μl, pH 8.5 ) for 16 hours, it was a constant temperature allowed to stand at 37 ℃. After addition of 0.1 M TEAA buffer (pH 7) (80 μl), 1 min isothermal left to deactivate the enzyme at 100 ° C.. After filtration of the residue, RP-HPLC (Senshu-Pak C18 or Waters C18; condition E) were analyzed by. Snake venom phosphodiesterase from Sigma, nuclease P1 used was purchased from Yamasa. By confirming the combined enzyme resistance of the phosphorothioate RNA 12-mer was to determine the absolute configuration of the phosphorus atom. Enzymes were used two kinds of 3'-exo⁻ a SVPDE and endo- nuclease is the nuclease nP1 stereoscopic decision. SVPDE the phosphorothioate bonds Rp body, NP1 is known as selectively hydrolyzing enzymes Sp body. Each oligomer, as shown in the above experimental method, 37 ° C., 16 h, and thermostatic left by enzymatic reaction. Then, after to inactivate the enzyme, and analyzed by RP-HPLC. As a result, All- (Rp) - (Ups ) 11 U 12 mer and All- (Rp) - In (CpsApsGpsU) 3 12-mer, all oligomers are enzymatically degraded by SVPDE, also All- (Sp) - ( Ups) 11 U 12 mer and All- (Sp) - (CpsApsGpsU) in 3 12 mers, all oligomers are enzymatically degraded by NP1. The results are shown in Figure 4. From this result, absolute configuration each Rp of synthesized RNA oligomer, that is Sp body was shown. r (CAGU) 3 - r ( ACUG) Measurement method 3 duplex melting temperatures All-isolated and purified (Rp) - (CpsApsGpsU) 3 or All- (Sp) - (CpsApsGpsU) 3 or stereo-random (CpsApsGpsU ) 3 or (CpoApoGpoU) 3 and the (ApoCpoUpoG) 3 respectively 0.45 nmol, 10 mM phosphate, dissolved in an aqueous solution (200 μl, pH 7) containing 100 mM NaCl, and 0.1 mM EDTA. Under reduced pressure oligomer solution, 165 [mu] l was added to 8 consecutive cells After degassing for 10 minutes, was raised to 90 ° C. at a rate of 5 ° C. / minute from room temperature, the state of 90 ° C. and held for 10 minutes, -2 ° C. / lowers the temperature at a min until 0 ° C., it was carried out annealing. After standing for 90 minutes the oligomer solution at 0 ° C., under a nitrogen stream, while raising the temperature to 90 ° C. at the 0.5 ℃ / min rate was measuring the absorbance at 260 nm at 0.5 ℃ intervals. Was synthesized by the synthesis method All- (Rp), (Sp) - (CpsApsGpsU) 3 12 mers, the melting temperature of the duplex formed between the native RNA 12-mer with a complementary sequence (Tm) It was measured. Since the absolute configuration of the phosphorus atom, are analyzed in detail effect on duplex formation ability, the three-dimensional native RNA 12-mer and a phosphorus atom is not stereocontrolled uncontrolled (CpsApsGpsU) 3 RNA 12 for even mers were evaluated duplex forming ability. Duplex melting temperature, 10 mM phosphate buffer closer to physiological conditions, was measured in buffer 100 mM NaCl. The results are shown in Figure 5 and Table 9. All- (Rp) - (CpsApsGpsU) Tm values of duplexes 3 12 mer forms are 65.38 ° C., 3.7 ° C. higher than the duplex native RNA form, the four nucleic acid bases inclusive Rp body was found to form a stable duplex than the native RNA. On the other hand, All- (Sp) - Tm values of duplexes (CpsApsGpsU) 3 12-mer is formed, 10.71 ° C. lower than the duplex 50.94 ° C. and native RNA form, can be unstable all right. Also, Tm value of a duplex phosphorothioate RNA which is not stereoregular is next 57.48 ° C., although it is unstable while slightly than native RNA, just duplex forming ability of the middle Rp body and Sp body to get. Above, it is summarized as follows duplex forming ability phosphorothioate RNA between the absolute configuration. Example 12: Using the synthetic oxa The phosphorylase Jin monomer units phosphorothioate RNA 12-mer by nucleic acid automated solid phase synthesizer, was synthesized stereocontrolled phosphorothioate RNA oligomers automated solid phase synthesizer. Given the application to RNAi medicament stereoselectively synthesized phosphorothioate RNA, the highly reproducible automated solid phase synthesizer in a simple RNA oligomers that is very to establish a process which makes it possible to mass synthesis is important. Therefore, we synthesized previously manual solid-phase containing four nucleobases discussed synthesized phosphorothioate RNA 12-mer by automated solid phase synthesizer. Automated solid phase synthesizer used was manufactured by Applied Biosystems of Expedite 8909 Nucleic Acid Synthesis System. Automatic In solid phase synthesis, using 5'-O- which is supported on HCP (DMTr) uridine (0.25 μmol) via a succinyl linker. Condensation time was 15 minutes. And chain length elongation by repeating the steps. Subsequently, concentrated ammonia -EtOH the column while leaving the DMTr group (3: 1, v / v) (4 ml) was added, to cut out from the solid support at 4h, 25 ° C., a 15 ml Falcon tube concentrated ammonia -EtOH (3: 1, v / v) transferred washing with (5 ml), 44 hours, and constant-temperature standing at 25 ° C.. Subsequently, the ammonia solution was evaporated until about 2ml, RP-HPLC (Senshu-Pak C18 or Waters C18; 12-mer condition D) were analyzed by. As a result, the desired product is obtained in the main peak, a condensation reaction with good condensation efficiency at each step without problems in automated solid phase synthesizer was found to proceed. Thereafter, preparative purified by RP-HPLC, it performed desalted by repeating 3 times the lyophilized residue with sterile water. The HPLC profiles of the obtained 12-mer shown in Fig. (Wherein, Bs are as defined above, CEM represents a cyano ethoxymethyl group, R 5 represents a protecting group for a hydroxyl group, R 6 represents an aryl group which may have a substituent) tables in comprising the step of sulfurizing oxa the phosphorylase Jin ribonucleoside that is after condensation. The method of claim 1 R 6 is a phenyl group. The method according to claim 1 or 2 R 5 is a 4,4'-dimethoxytrityl group. The method according to any one of claims 1 to 3 carry out the condensation in the presence of an activating agent. The method of claim 4 using N- (cyanomethyl) pyrrolidinium triflate or N- phenyl imidazolium triflate as an activator. The method according to any one of claims 1 to 5 using dimethyl disulfide as a sulfurizing agent. The method according to any one of claims 1 to 6 comprising the step of repeating the step n + 1 times with the general formula (III) The compounds wherein n is 0 as a starting material. The method according to any one of claims 1 to 6 carry out the reaction in the solid phase method. The method of claim 8 using the compounds wherein n is 0 in the general formula (III) bound to a solid support via a linker where necessary. Or (n + 1) X is a divalent group represented by any (II-Sp), or any one of claims 1 to 9 which is a divalent group represented by any (II-Rp) the method according to item 1. General formula (I) (wherein, R 1, Bs, n, and X are as defined above, provided that R 2 is a cyano ethoxymethyl group) according to claim 1 ribonucleoside phosphorothioate represented by or a salt thereof. Formula (IVa) or (IVb) (wherein, Bs, CEM, R 5, and R 6 are the same meanings as defined above) according to claim 1 oxa The phosphorylase Jin ribonucleoside represented by.